Residencies and Workshops provide teachers with engaging programing that ignites kids’ imaginations and gets them excited about learning, and with merger, the organization is better equipped to work with all ages of young people—from early childhood and school readiness through high school math and humanities. 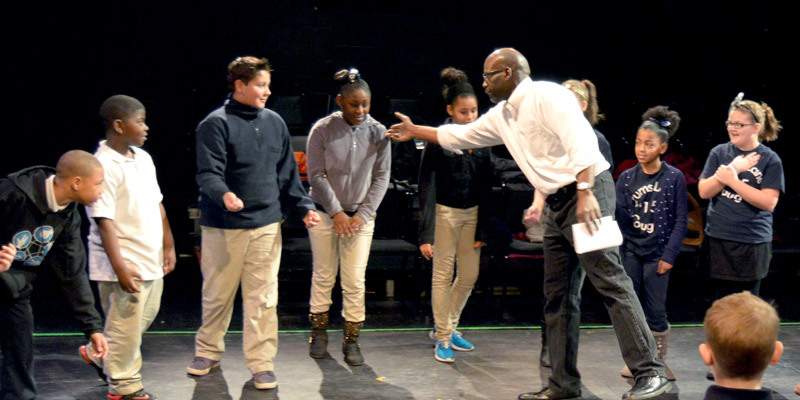 Students participate in character- & story-driven theatre exercises in fun, energetic sessions that introduce foundational acting techniques. The program may be expanded into a multi-session residency to suit specific grade levels and curricula, including an optional culminating performance. Call for info. WORKSHOP: Grade PreK | $125/session, 18 students max. Jungle Expedition: A new species of butterfly has been spotted in a hidden location! We need a team of young scientists to follow directions to the secret environment and use their powers of observation to document the new species. Teaching Artists, students, and classroom teachers enter the world of pretend to become the characters and act out a story filled with challenges that build school readiness skills. Jack & the Beanstalk: Kids help Jack save the day as they climb together into an enchanted world of exciting characters and strange happenings. This story is active, filled with problems to solve, fears to overcome, and a surprising ending. Little Red Hen: Kids endeavor to make bread with the Little Red Hen by caring for and processing grain, asking for help from reluctant neighbors and winding up in a gentle confrontation on feelings, choices, and behaviors. The Pigs and the Wolf: As city-dwelling pigs with a working parent, kids jump into designing and building the new family home. This reimagined story asks children to weigh their wants and needs­ while managing resources and practicing real-life safety measures. A lively storytelling program that uses interactive listening and the tradition of oral storytelling to build comprehension and language development – skills vital to early literacy. Children practice focused attention from a seated position and participate imaginatively, contributing sound and movement under the guidance of the storyteller. English: In this immersive workshop, a Teaching Artist shares an original tale – transforming any classroom into an active learning environment where students become the characters, from rambunctious elves to underwater creatures. Spanish: Teaching Artists guide students in playing characters in Spanish language stories that build vocabulary and grammar including greetings, colors, parts of the body, members of the family, and more. Tales are from European, Latin American, and Huichol traditions. Objectives of the program are to identify & analyze stereotypes, strengthen emotional literacy, and build community between groups of different backgrounds and traditions. Participants build trust & teamwork through theatre activities, learn elements of drama, and focus on written & verbal storytelling. Students examine both obvious and subtle bullying behaviors by employing a range of drama games, group discussion, and creative role play. By using acting skills to inhabit situations, students learn proactive responses to defuse bullying while also uncovering their own connections to this topic. Support almost any history unit with an interactive theatre workshop where students use their imaginations to analyze the characters and events they’re studying. Bring the people and events to life! 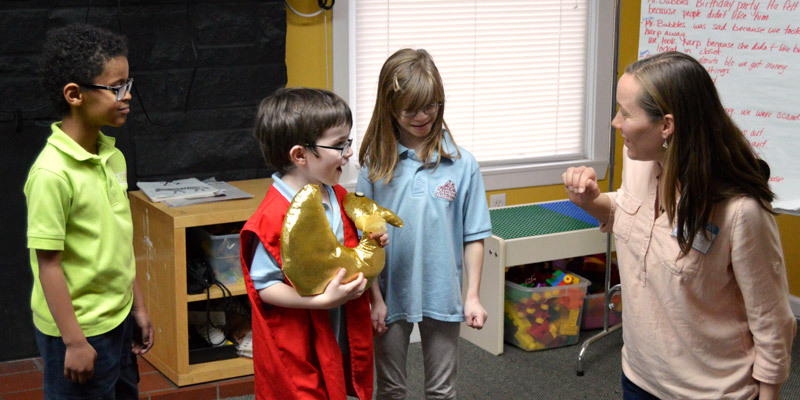 Students create episodic plays based on history and perform them in chronological order, illustrating cause and effect and boosting content retention. Students participate in interactive theatre games that reinforce their science curriculum. Program culminates in performances of student-created scenes or monologues that identify misconceptions about Earth and the universe and are intended to educate peers about important astronomy concepts and how they give rise to seasons, day and night, the phases of the moon, and other familiar phenomena. Contact us about additional science programs or opportunities to develop new content areas. Contact us about additional science programs or opportunities to develop pilot programs. Students explore the real-world applications of mathematics, beginner or advanced, by writing and performing original scenes that educate peers about how the math they’re learning in school could one day save their lives. Younger students experience a land before time, where their math skills are the only thing standing between them and a hungry pack of raptors or a stampeding herd of diplodocuses. Older students imagine how math could one day save their lives in the event of a zombie apocalypse. *Classroom indicates up to 30 students. Workshops (single-session), and Residencies (in-depth, multi-session) take place at your location. No bus required!